Artwork | Who, What, Where? At Grand Station, artist Lere’s project Who, What, Where? 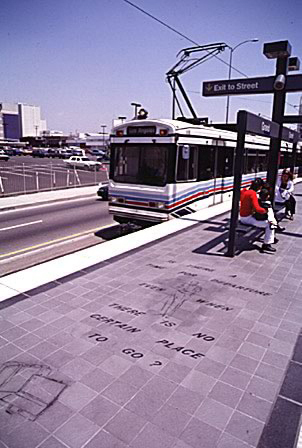 consists of a series of images sandblasted into the platform pavement. Many of the images—human figures, symbols, and text—use travel as a metaphor for life and the way we pursue our goals and aspirations. Lere challenges passengers to think about where they're coming from and where they think they're going. Grand Station is one of the busiest on the Metro Blue Line and serves Los Angeles Trade-Technical College. Who, What, Where? emphasizes the importance of questions in the educational process. The essential theme of the work is set out at the station entrance in a quotation from one of James Thurber's modern fables: "It is better to ask some of the questions than to know all the answers." 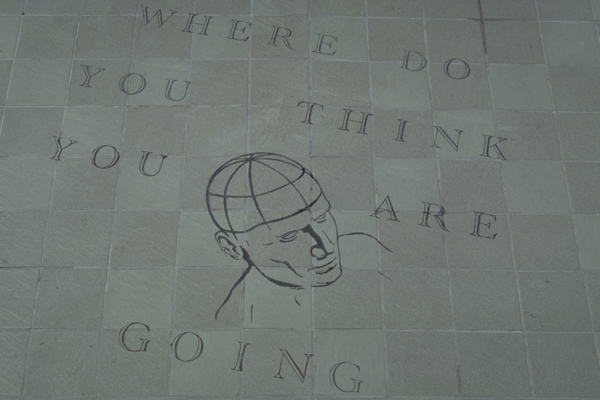 The same idea is echoed, though less explicitly, in a giant question mark at the opposite end of the platform. "I'm posing questions, both whimsical and serious, asking people to question themselves in their traveling situations."